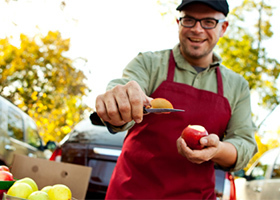 Donating surplus food enables your business to directly provide beneﬁts to people who are living in disadvantaged circumstances whilst having a positive impact on the environment. helping you to achieve your business’s environmental targets. Food redistribution organisations such as Foodbank, OzHarvest and SecondBite support large and small welfare agencies who provide various forms of emergency food relief – from breakfast programs for kids who go to school hungry, right through to community kitchens that provide daily meals for people who are homeless or living with disadvantage. So if you have surplus food, why not redistribute it instead of just sending it to landﬁll? The positive impact this decision can have is the best option for your business, the community, and the environment. emissions associated with food waste. Our ‘Food Waste Toolkit’ will help your business to achieve these outcomes. It has been brought to you by Do Something!, NSW Environment Protection Authority and SecondBite. Do You Have Surplus Food Going To Waste?